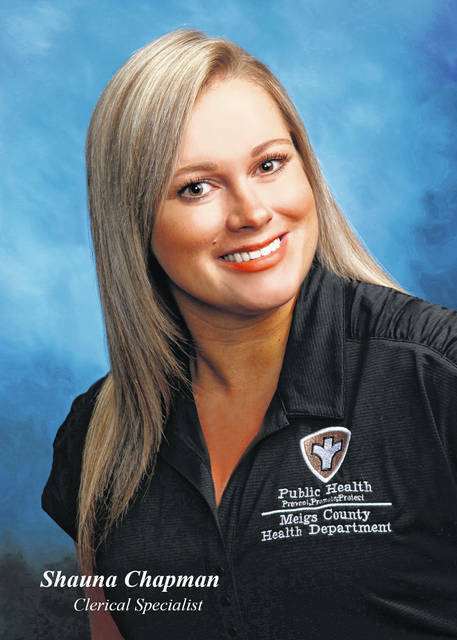 Editor’s Note: As part of the Meigs Health Matters column, the Meigs County Health Department is introducing its employees through the employee spotlight each week. Each employee of the health department will have an opportunity to introduce themselves and the services they provide to the community via Meigs Health Matters articles throughout 2019. My name is Shauna Chapman. I was hired as the Clerical Specialist at the Meigs County Health Department in February of 2018. As a lifelong Meigs County resident, I am happy to have the opportunity to work in my hometown. I feel that I have a true understanding of the needs and wants of the people in this area. I consider it a great privilege to be a part of such a hardworking group of individuals who are so dedicated to improving the health our community. My position as the Clerical Specialist is full-time and my responsibilities often vary as I have duties in several different departments. I am responsible for the accurate collection of monies coming into the agency and delivering the funds to our Fiscal Officer; data entry for the nursing and environmental departments; issuing licenses, permits, etc. for a variety of operations such as food service and household sewage systems; receive and assign animal bite and nuisance reports; register patients for all clinical/nursing services offered; issue birth and death certificates; answer and direct all incoming calls to the correct recipient; updating our webpages for important announcements such as food recalls and local boil advisories and other administrative tasks as assigned. Whether it be in person or answering incoming calls, I am the first person many people have contact with at the Health Department and I strive to ensure a positive experience for the customer and to always leave a good first impression. I take great pride in my work and believe that showing up with a positive attitude every day is extremely important. I strive to be caring and understanding to everyone’s needs and concerns and I hope to always leave positive impact on our community for years to come. Shauna Chapman is the Clerical Specialist at the Meigs County Health Department.